We've already got Lynnfield CPUs in our labs for a splash of testing, but we can't give you the results just yet, or Intel will... well, you don't want to know. What we can do is take you for a tour around one of Gigabyte's upcoming Lynnfield motherboards, based on the Intel P55 chipset. We contacted Gigabyte to ask about its complete P55 range and were told there would be six versions in total for the UK market: P55-UD6, P55-UD5, P55-UD4, P55-UD3, and two microATX boards, the P55M-UD4 and P55M-UD2. 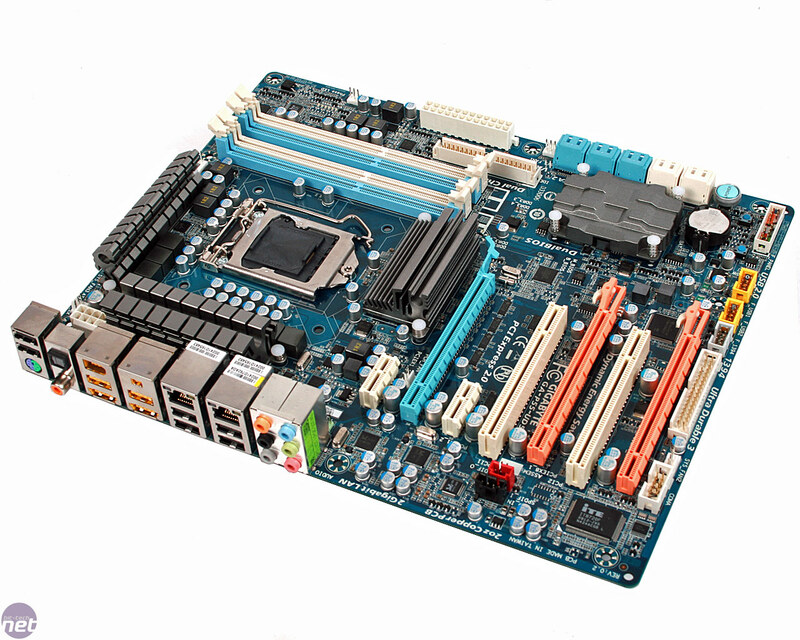 The board we received to look at was the UD5; the "U" in the UD5 stands for the same Gigabyte Ultra Durable 3 technology featuring on current boards, while the "5" denotes the feature set should be pretty substantial. 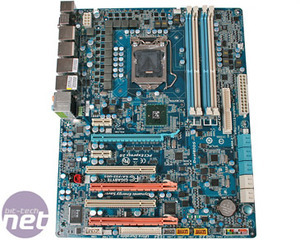 Most obvious on the board is the LGA1156 socket for Lynfield CPUs. 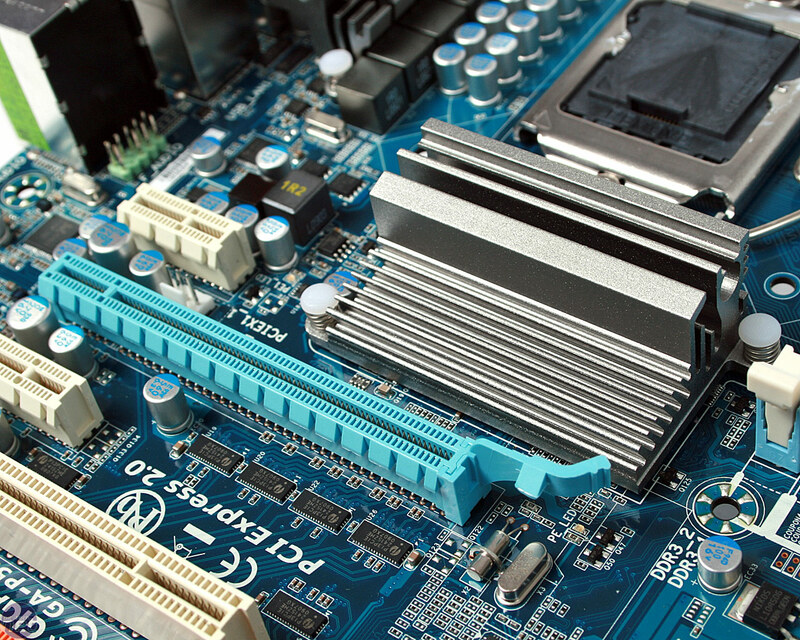 These will be sold as both Core i5 and Core i7, depending on the CPU features a particular model has. 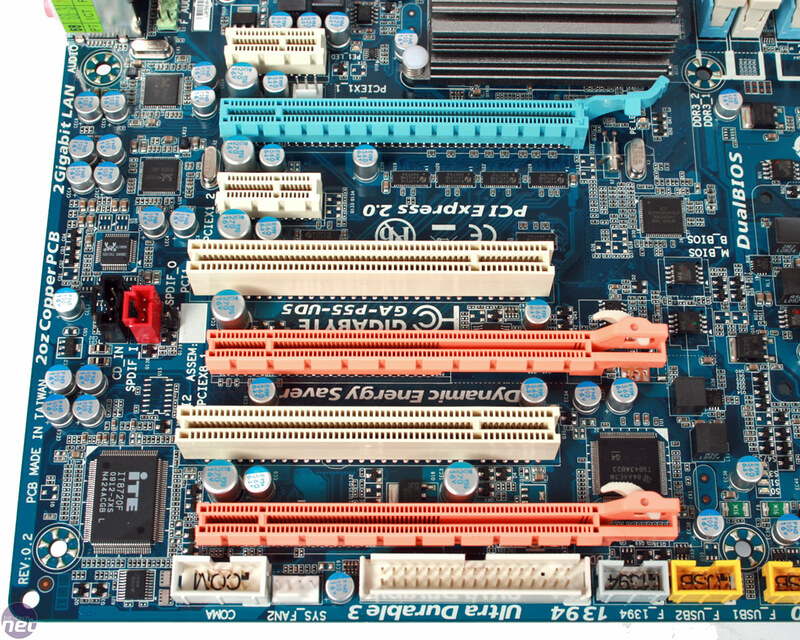 Lynnfield CPUs, unlike current Core i7s, support dual channel memory, so the UD5 features four DDR3 slots - although it doesn't allude to the speeds supported. 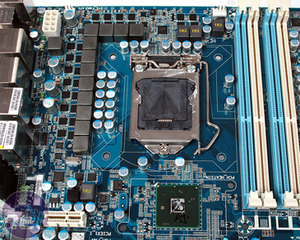 Around the CPU socket Gigabyte has squeezed in 12+2 power phases (the driver ICs underneath confirm this), using a standard pair of Power-PAK MOSFETs underneath the two heatsinks circulating the CPU socket. This is a far cry from ludicrous 24 phase boards we saw at Computex this year. 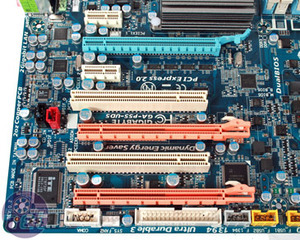 The stone grey heatsinks around the CPU socket are similar to those we've seen on previous generations of Gigabyte boards, and judging by the circular holes cut into the three it looks as if the final product will have a "U" shaped heatpipe circulating between them. 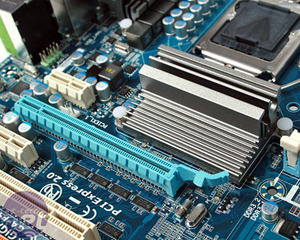 Gigabyte explained that it will extend to all, including the one for SATA chipsets as well. 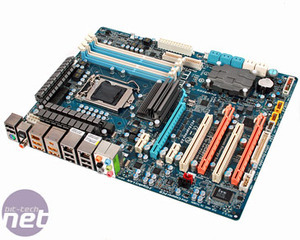 You'll have noticed that the P55 chipset itself, instead of being situated where the Southbridge is usually seen is placed where the Northbridge is traditionally situated, between CPU socket and first PCI-Express slot. 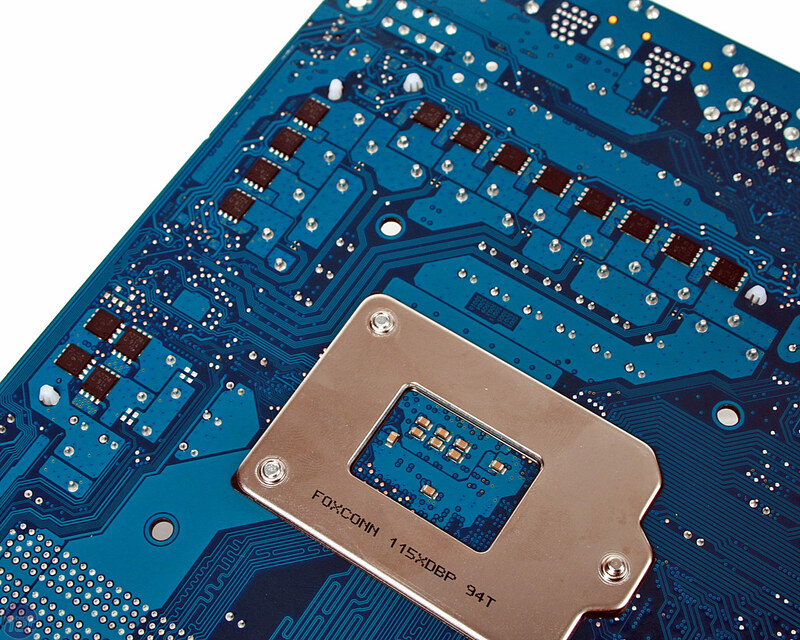 Unlike previous Intel chipsets, P55 is a single chip design. The "Southbridge" heatsink is simply to cover the two Marvell 88SE9123-NAA2 SATA 6Gbps chips - not that they need it, it's simply there because more metal makes the board look faster. 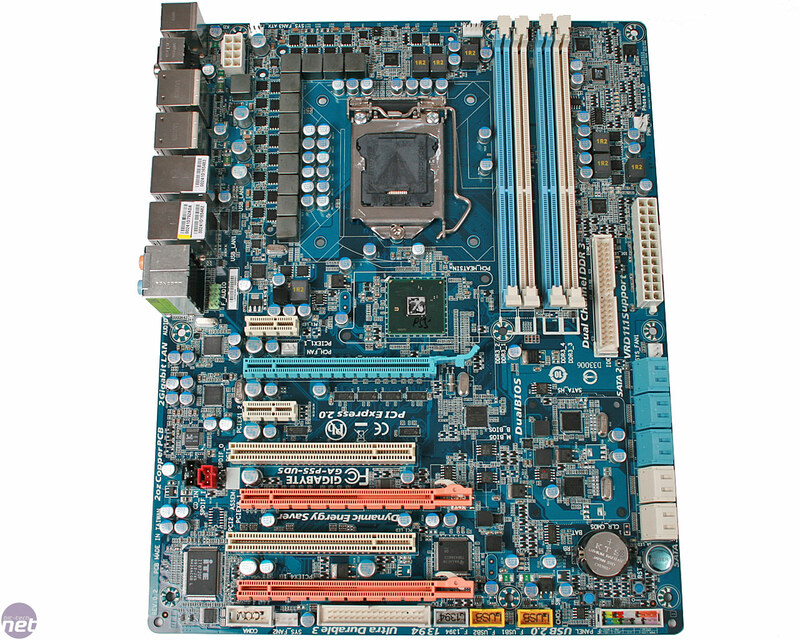 The UD5 features three PCI-Express 2.0 x16 slots. Only the top two are powered by CPU the directly, offering either a single x16 link or two slots with eight lanes each. The bottom slot is therefore a four lane one, connected to the P55 chipset, not the CPU. Intel hasn't seen fit to beef up the PCI-E count on the new chip compared to older ICH Southbridges. Gigabyte confirmed with us that both CrossFire and SLI are supported on the two main physical x16 slots from the CPU.